I should be cleaning or prepping something for next weekend, but I decided I'd rather make a card. Sometimes you just need some creative time! So I browsed my favorite challenges and decided to combine a color and sketch. The color challenge is at Hand Stamped Sentiments, and the sketch is the Saturday Sketch at Stamping 411. Here is what I came up with, after a brief struggle as to where to start! I decided in the process why I like this set, Season of Friendship. It lets you put colors together that wouldn't work as well with other sets. And with the different tree elements, it gives you lots of options!! Card base is Early Espresso, background is Pear Pizzazz DSP. In the center, I stamped the tree in Espresso and added tons of leaves with Pear. Some leaves are full strength, some stamped off once. I stamped three flowers in Real Red and two birds in Pacific Point, cut them out and attached with dimensionals. Oh, the flowers have Early Espresso brads in the center. Layered onto Early Espresso, and attached over a narrow grosgrain ribbon in Espresso. Get Well Wishes from Teeny Tiny Wishes was added in Pacific Point at the bottom right of the tree panel. Thanks for stopping by! I need to do something productive before calling it a night! Love this!! the color choices, stamp set...everything. Great job!! I totally hear you, sometimes if you fit in some stamping time first, the prep goes better later on! (at least that's what I keep telling myself lol! )...you did a great job on this card, glad you could join us this week! Who can prep when a card like this needs to be made! Wonderful. So pretty!! Love how you used this set! I just love that stamp set! I have wanted it for the longest time and every time I see it I think of a million reasons why I need to get it... so much for my budget. Thanks so much for playing along with us at HSS we are so glad you decided to stop by and stamp. Love your tree and the blue birds! Such a happy scene. Thanks for playing at Hand Stamped Sentiments. Beautiful job. This is one of my favorite stamp sets and I LOVE how you made the birds "POP" off the card. Thank you for joining us at Hand Stamped Sentiments this week. Such a pretty card! I wish our tree had that many leaves on it!!! 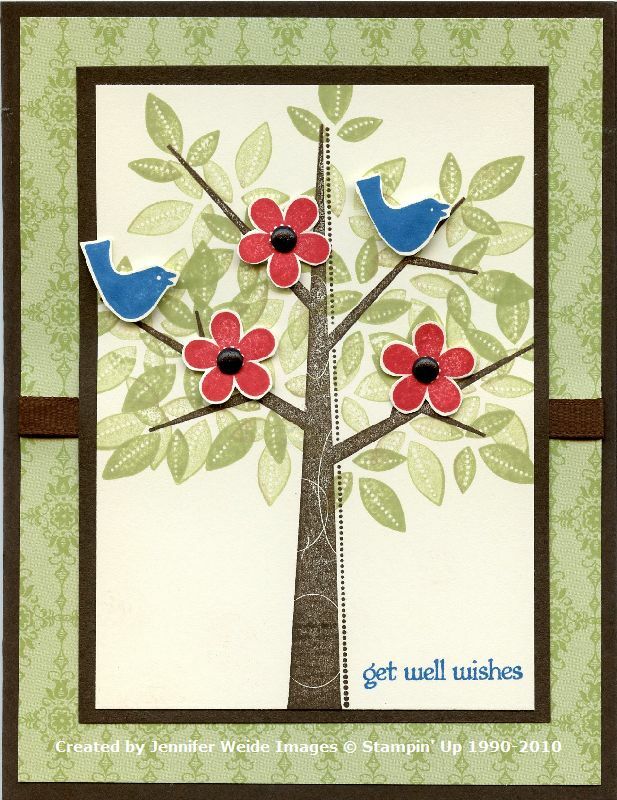 The cut out flowers and birds look fabulous popped out on the card! Very pretty card done with that set! Great job! Love this card! Great way to add dimension! A card that makes me smile.. Absolutely gorgeous, I love all the detail! How cool. That tree is very cool, especially with what you added. Very fun.